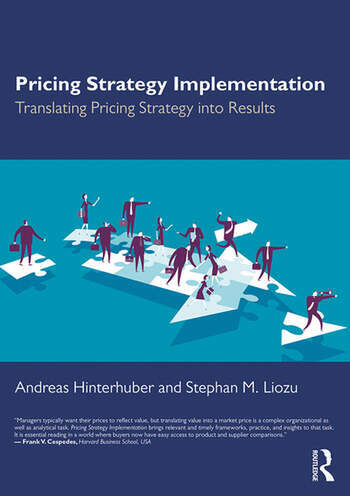 Taking a new approach, Pricing Strategy Implementation is a critical and practical tool for practicing executives and managers, as well as academics and researchers in pricing, marketing strategy and strategic management. Andreas Hinterhuber is an Associate Professor at the Department of Management at Università Ca' Foscari Venezia, Italy, and has been a Partner of Hinterhuber & Partners, a consulting company specializing in pricing based in Innsbruck, Austria. He has published articles in leading journals including Journal of Business Research and MIT Sloan Management Review, and has edited many books on pricing, including Innovation in Pricing (2012), The ROI of Pricing (2014), Pricing and the Sales Force (2016) and Value First then Price (2017). Stephan M. Liozu is Chief Value Officer of the Thales Group (www.thalesgroup.com), the Founder of Value Innoruption Advisors (www.valueinnoruption.com) – a consulting boutique specializing in value-based pricing, data monetization, and digital pricing – and he is an Adjunct Professor and Research Fellow at the Weatherhead School of Management at Case Western Research University, USA. Stephan sits on the Advisory Board of LeveragePoint Innovation and of the Professional Pricing Society. He is the author of multiple books about pricing, including Pricing and Human Capital (2015), and co-edited Innovation in Pricing (2012), The ROI of Pricing (2014) and Pricing and the Salesforce (2015).